(Waldorf, Md., Sept. 22, 2017) - The Southern Maryland Blue Crabs (1-2) took game three of the best of five playoff series against the York Revolution (2-1) 9-2, extending the series another game. With their playoff lives on the line, the Blue Crabs sent All-Star Brian Grening (1-0) to the mound for game three. Grening worked a 1-2-3 first inning, before being given a lead in the bottom half of the inning. Nate Samson walked, coming around to score on a two-out double from Michael Snyder that just stayed fair in right field. Southern Maryland added another run in the second, as Patrick Palmeiro singled to drive in Cory Vaughn. The offense then exploded in the third inning, putting up four runs in the inning off Frank Gailey (0-1). Samson started the rally once more, this time singling as the leadoff man in the inning. L.J. Hoes was up next, hitting a groundball to third on a hit and run call. Chase Simpson’s throw to first skipped past Telvin Nash, allowing Samson to score all the way from first, and move Hoes to second as well. 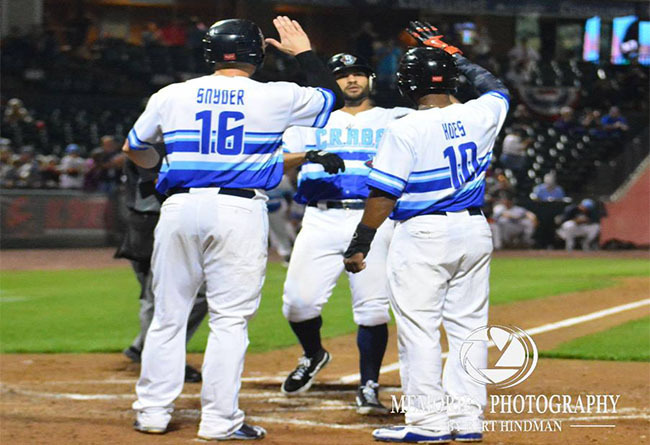 Gailey walked Snyder to follow, before two batters later Vaughn crushed a three-run homerun to left field, giving the Blue Crabs a 6-0 lead. Grening continued strong on the mound, not allowing a hit until the fifth inning. The offense wasn’t done putting up runs for the right-hander either, as Snyder added a solo homerun in the sixth for a 7-0 lead. Grening walked Alonzo Harris to start the sixth inning, with a groundball and a flyout moving him up to third. Grening responded by getting a flyout from Nash, stranding the runner in what proved to be his final inning of work. The scoring still wasn’t finished for Southern Maryland, as they put another run on the board in the sixth. Jose Lozada walked with one out, moving up to second on a hit-by-pitch of Samson. Hoes followed that with a double, easily scoring Lozada to add another run to the total. More of the same came in the eighth, as the Blue Crabs strung together three singles to put the score at 9-0. Closer Cody Eppley came on to work the ninth, looking to extend the series another day. Eppley allowed a single to Michael Burgess, who came around to score on a double from Isaias Tejeda. Down to their last out, York strung together back-to-back hits, bringing the score to 9-2. Eppley bounced back to get Harris to ground out to the mound, finishing off the night. The Blue Crabs will return home Saturday, September 23rd for game four of the best of five playoff series against the Revolution. Southern Maryland will send RHP Drew Hayes (8-8, 3.94) to the mound, with their playoff lives still on the line. First pitch is scheduled for 6:35 P.M. on Saturday at Regency Furniture Stadium. The Blue Crabs play 140 regular season games in the Atlantic League of Professional Baseball Clubs. The Blue Crabs play at Regency Furniture Stadium in Waldorf, Maryland with affordable family fun. Please call 301-638-9788 or visit www.somdbluecrabs.com for more information and to reserve your seat at the ballpark today!